This is a fabulous machine. 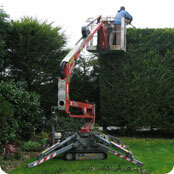 Only 1m wide you can bring this cherry picker virtually anywhere. The tracks leave very little marks on lawns. Hedge cutting tree work, painting your house etc. This machine is a real all rounder.